This is a fabulously indulgent vegetarian dish, combining tender smoky aubergine with lots of melted mozzarella and a rich tomato sauce with a hint of heat from the Chilli Pepper Pete’s Mulato chillies. It takes a little while to prepare but it’s really worth taking your time with this one, as the end result is a glorious comfort food favourite. 1. First, make your tomato sauce – it’s best if it can have a little while to simmer on the hob, to make it really delicious. Dice the onion and crush the garlic, and get them frying gently in a splash of olive oil – you want them to soften, rather than crisp up. 2. In the meantime, rehydrate the dried Chilli Pepper Pete’s Mulato Chilli by covering with hot water in a small bowl. Leave it for ten minutes or so, until it’s nice and soft, then remove the seeds and stalk and chop as finely as you can. 3. Once the onions are really soft and translucent, add the plum tomatoes and break them up well with a wooden spoon, and stir through the Chilli Pepper Pete’s Mulato Chilli. Season with a good pinch of salt and black pepper, 1 tsp sugar, and a generous sprinkling of dried oregano. Leave the sauce to simmer on a low heat for at least ten minutes, or up to half an hour, stirring occasionally. 4. Next, cut the aubergine into thin slices (about 5mm thick), and do the same with the mozzarella. Now’s a good time to start preheating the oven, to 220˚C (200˚C fan). 5. Heat a generous splash of olive oil in a frying pan, and once it’s nice and hot, start frying the aubergine slices – do them in batches so there’s only ever one layer in the pan, turning them over to do both sides. You don’t need to fry them for long, just enough to turn them golden. Each time you put in a new batch, add another splash of olive oil. Meanwhile, lay the slices you’ve already fried on a couple of sheets of kitchen paper, to remove the excess oil after cooking. 6. Remember to check on your sauce – by now it should have thickened up quite a lot, so add a splash of water to get a consistency that’s thick but pourable. 7. 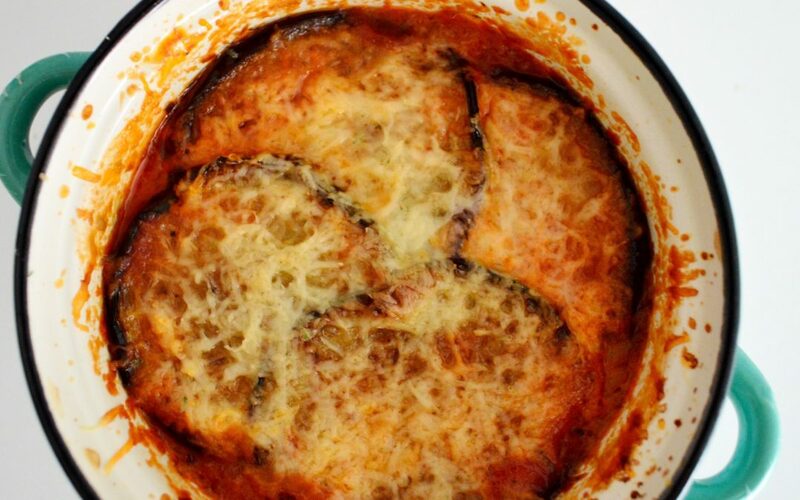 Once all the aubergine is cooked, you can start assembling your parmigiana. In a medium-sized baking dish, start with a layer of aubergine slices, then about a third of your tomato sauce, and then a layer of mozzarella. Repeat twice and finish with a final layer of aubergine. Top with grated cheddar and place in the preheated oven for 20 minutes. 8. Once the time is up, you can serve straightaway – but if you leave it to rest for 20 minutes or so, the texture will be perfect.